Participants: Anna Ochkina, Ann Wright, Pieter Tenlinck (Vrede), Kristine Karch, Pat Elder (civilian Exposure), Ludo De Brabander, Reiner Braun, Chris Nineham (CND), Joseph Gerson, Medea Benjamin, Josie Lenusell, Ellen Barfield, Kate Hudson, Marion Küpker, Wash. D.C. Catholic Worker: ArtiBilber, Carol Albeit, Audeth Platte, John La Forge, Susan Crane, Paul Martin, Miles Thomas (VFP.org), Alexander Neu, Bruce Gagnon (Global network against weapons in space). 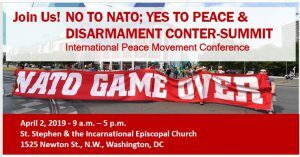 Kristine’s report (https://www.no-to-nato.org/2019/04/presentation-at-the-annual-meeting-2019-in-washington-dc/) – Brussels counter-summit – demo, conference, c.d. ; start creating the no nukes in Europe Network (NoNukes)*, Ramstein peace camp and rally, G-29 Hamburg – demo, blockades, alternative summit, Dublin no US/NATO bases conf, actions against the security conferences in Munich, call to action for 16th anniversary of Afghan invasion, statement on ICAN’s Nobel peace prize, May 2018 protest on US withdrawal from Iran Treaty, Stop NATO wars on 20th anniversary of NATO Yugoslav War, statement to Venezuela, advertisement in the Guardian “Appeal to defend the INF Treaty” together with the NoNukes network. Alexander’s response to Medea: Opposition to NATO and getting people onto streets with focus on 2% and INF withdrawal. Reiner: Green’s in Germany increasingly a war party & support 2%, though many members oppose. New story about who should pay for US bases. Now countries pay 18%- for Germany that’s $1 billion. Trump now saying pay 100% plus 50%. He says if they fully support the US, they don’t have to pay the 50%. That would mean 6 billion. 140,000 signatures – biggest signature campaign in many years. Ludo: with US social needs – should be campaign making the connection. Making issue of US nuclear arms in Belgium. Most people oppose, trying to translate the majority into a mobilization – making connection to 1980s. Possible US-European joint action. Marion: In Germany movement is divided. Concern about German militarization, so they want Germany in NATO. Oppose nuclear sharing. People say Russia as well as US withdrew from INF. Need to focus on missile defense. 2012 Chicago summit (see also here: https://www.no-to-nato.org/actions-around-nato-summits/2012-chicago/), nuclear strategy agreement includes nuclear burden sharing, putting US nukes in their country, politically accepted, and paid for in part by the host nations. Why did they accept? Common enemy is Russia and need for a deterrence, also relations in NATO. EU wants US in Europe for close transatlantic relations, and belief that it requires hosting nuclear weapons. But there is will of the people and mistrust of the US – thus there’s a source of hope: 2010 led by left party, Bundestag called for withdrawal of US nukes, but not in a position to do that now as peace movement isn’t as strong, also growing anti-Putin & anti-Russia phobia. Success of anti-NATO movement has been reduced support for NATO since Strasburg, down from 80% to 70% in Germany. Alexander: after Ukraine, US presses that Russia wants to split US & Europe, that we have to stand together. Anna: after Ukraine, Govt’ declared NATO an enemy, and call for support for Russian gov’t. After 2018 pension reform, people’s support for and trust of government diminished. Ludo: only a small part of the MIC supports the nuclear weapons in Europe. Gov’ts don’t admit that there are nuclear arms because of NPT Article II. Europeans would drop the weapons in case of war, not US. A need is to force their governments to admit that they have the weapons. Nuclear commitment reaffirmed in Lisbon as “cornerstone’ of NATO strategic concept. Never discussed in parliament. It’s kept secret. Lots of NATO issues not discussed or even confirmed. Kristine: problem of bases seen as a basis of jobs and economic security. Best jobs are done by white US-Americans. Marion: 500 mayors for peace cities. Pressing for nuclear free Germany and support for ban treaty. If signed ban, the weapons would have to go. Preparation for London counter-summit has to be the primary focus. Great partners with Stop the War & CND. CND as the only mass movement in Europe vs. nuclear weapons. Additionally, to organize simultaneous demos in other countries. How to develop and enlarge END, now part of A-2000. Possible Brussels meeting in September at end of INF Treaty to plan collaborative action. End of INF the way to the next major war. European parliamentarians’ statement to prevent end of INF with new NoNukes network. Deeper and longer discussion about European militarization, the building of a military superpower, PESCO, military budget, etc. The first step will be 2 events in Amsterdam April 13 & 14, 2019. Public event organized by Socialist Party and 2nd day workshop as per our invitation. It’s integrated with NATO, but separate. 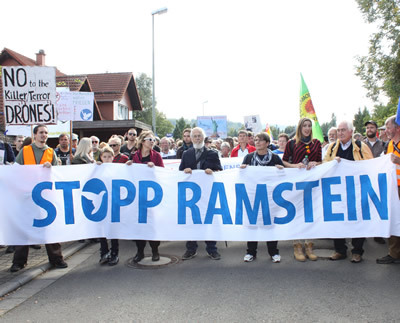 Ongoing work against military bases – next int’l conference against military bases and war at Ramstein. Possibility of 2020 international day of action against military bases. Balkan region: 30th member of NATO is North Macedonia. Need for a workshop, seminar, workshop in Balkans to discuss anti-nuclear weapons needs in Balkans. There were national movements there against NATO enlargement. Need for an NoNukes network meeting in Brussels to discuss European responses to INF, possibly with transatlantic connections. Initial discussions have been held with Transform. For statement or more likely campaign TBD. (Need to bring issues together, as it’s difficult to keep up with one Trump crisis after the next. Want to address threatened end of New START, pressure on government to buy the F-35s. Need to develop a good agenda. The BAN Treaty can help to frame it. Need to engage climate change & build a broad movement that can engage youth. B-61 doesn’t deal with INF, it’s a bomb. Agreement seems to be to continue discussion about how to create a broad movement, integrating issues – INF, euro-missiles and more. Should be outside No to NATO Network, so ICAN and other organizations not on record opposing NATO can join. 1980s trade unions played a major role.) The challenge is how to bring these groups together. Brochure about our Network’s work. Founded after Strasbourg. Next meeting should be a 2-day seminar for longer and deeper discussion/political exchange. Uncertain what post INF response will be: new conventional weapons, more nukes in Europe, possible offer of negs. Of nets with Russia with putting in nuclear weapon s if the negotiations fail. Decision will be made at NATO summit. Possible U.S. peace camp outside PANTEX as the begin building 5 kiloton nuclear weapons there. Possible linking with a parish there. To be ready to ship to submarines in September. There is a bill backed by Smith that could halt the shipments. B-61 12 being built in (non-nuclear elements) Kansas City and (uranium jackets) Oak Ridge – Northrup Grunman. Information to Belgians would be helpful. Oak Ridge Peace Alliance. Final assembly at Pantex. Introduction to Allen Sullentrop to be made at the 4/2 conference. 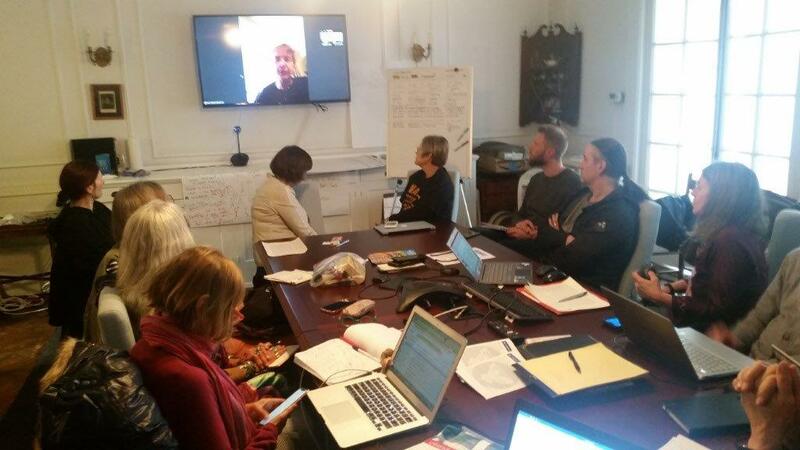 Possibility of a US camp in Maine, to be organized by Bruce Gagnon. Possibility of inviting European camp organizers to be a partner. Need a location and local group, with each group organizing young people to participate. Possibly Kansas City Peace group. Possibly Kansas City or Oak Ridge (2020) or Aberdeen Proving Ground. Create US planning group for this summer: Pat, John, Medea, Ann. Iran: need for coordination with Europeans, Berlin or Brussels. Possibly to engage European Parliament. Need to work with Europeans to implement plans with Iranians. What’s happening in Europe: May 26 EU elections, can’t organize meeting before or immediately after. Have to wait for outcome of election. Brussels, with the parliament, would be the place to meet. 2 central players, EU & Germany. Germans are very cautious, doing nothing to oppose US plans. Germans are blocking plans to create the independent payments plan. All of this is leading to more hard line in Iran. New parliamentarians convene in September – could be more conservative, greens 2nd. Possibly schedule the meeting with the END no nukes meeting. NATO demanding end to missile development and renewing nuclear infrastructure. Import that the Europeans pushed back on the meeting in Warsaw. Concerns in Europe about sending medical/humanitarian items in, with U.S. pressure. Need to press on this. There is a strong link between German and Iranian business, pulling back because they don’t see gov’t pushing back. IFOR leader, Ronnefeld, with a tv program, has good links and knowledge that we could build on. Need for Medea to come up with ideas for lobbying – bring to Brussels, and then in Berlin. We need to have a deeper discussion about sanctions” Russia, Iran, Venezuela, Myanmar, North Korea, Cuba, Nicaragua. We need a general position. It doesn’t work anymore. It’s a form of war. Need to develop a statement on sanctions. Goal is often to instigate civil war. (Problem of people visiting Iran, Syria, etc. getting visas to U.S.) Need for Europeans to break with Trump on Venezuela. Use the anti-Trump sentiment. Action/statements in Europe would reinforce the work here in the U.S. Possibly No to NATO statement on Venezuela and growing militarization around it: new U.S. military bases in Latin America, bringing Brazil in. ICC to develop a discussion about sanctions. Develop statement on Iran opposing sanction. Meeting for no nukes in Brussels, possibly linked to meeting @Iran. ICC work for int’l day against militarization in 2020 & 2019 or 2020 int’l day against military bases. Attempt to organizing workshop/conference around expansion of NATO to Balkans (and Georgia). A 2-day discussion at 2020 annual meeting in Ghent. Make brochure about global NATO and about network. Ludo & Joseph brochure on global NATO. Lucas to do the network brochure. 2020 July 16, 75th anniversary of “Trinity” Atomic Bomb test. New ICC: Current members to continue. Invitation to all here to join, with 2 from this group: Pat Elder and Alexander Neu. Possibly day to day steering group. Stuttgart appeal 2009 the foundational document for organizations to sign, is still the relevant document. *Network no nukes in Europe founded by the 5 Nuclear Weapons host countries (Belgium, Netherlands, Germany, Italy, Turkey) and the 2 nuclear weapon states (France, UK). The network is meanwhile accepted as an Abolition 2000 working group.